Wow! Remember that? October 1980? When the nation was gripped with national pride at the thought of "our" boys giving those tinny Japanese, weird French and rotten Italian superminis a darned good hiding? Remember the ad campaign? With the formation of Metros (or Mini Metros to be correct) heading towards the edge of the cliffs at Dover? I recently managed to get hold of this cassette tape. They were apparently distributed to dealers at the time of the launch, something to play whilst the punters got to grips with the wondrous space-efficiency of the cabin, the neatness of the split-fold rear seat and the lack of a five-speed gearbox. The tape is brilliant. It begins with a rousing and classically funked-up version of "Rule Brittania", which becomes a generic synth-lite soundtrack played whilst a male voice extols the virtues of the "Britishness" of the car. "It's the brainchild of a British design team, it's been developed by British engineers, and it's built by British workers, in a new, British, factory. But what about 'leading the world'? Is it really better than all those European and Japanese hatchbacks?" You can guess what the answer is. "The answer's yes. In ANY language." 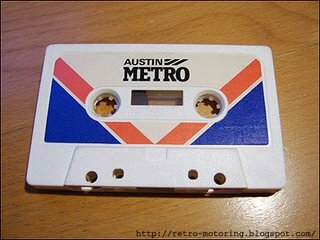 The first Metro I saw was owned by a neighbour who brought it home on the day of launch. It looked GREAT in bright Pea Green with gold pinstripes, shining on a W-Plate. If memory serves, it may well have been an "S" variant, incredibly rare in the 1980s, let alone now. Somehow we really did think that this car was going to be the saviour of the British motor industry. Magazines raved over it, proclaiming it as a true successor to the Mini. It kind of was for a while, but it wasn't long before the build and rust problems took precedence in the mind of the public over the engineering quality. The slightly unbalanced styling didn't help either, same with the underpowered and controversially "badge-engineered" MG and MG Turbo variants. Remember the red seat belts? Nowadays they are largely unloved and almost forgotten. An early one with the full-size grille (and the povo-spec ones with the indicators and sidelights in the bumper) in a retro colour is an incredibly rare sight now. That's a real shame. They are absolutely hilarious to drive, inheriting many of the characteristics that made the Mini so great, and a few that made the Metro not-so-great (the wheezy A-Series wasn't replaced until the K-Series powered revamp many years later). They are STILL amazingly space-efficient, and the earlier pepperpot-shod MGs and Turbos are quite stylish in a retro-80s-cool kinda way. A British Car To Beat The World? Nearly. E30 BMW 3-Series Baur TC. Quite a rarity, and NOT the same as the much more common Convertible that came later. I'd appreciate any more information on them! A good (E21) Baur site can be found here, and a German BMW Baur Club here. A Peugeot 305 van. I see this around here loads! The pic doesn't really do the superb wheeltrims justice. Can't be many of these left now - like all vans, I guess they suffer from a lifetime of abuse as "working" vehicles. Starting to disappear rapidly from our roads nowadays, a first-generation Renault Espace. Still plenty about though, grab one of these genre-defining Matra wonders while you can! "...and when they met, it was MOIDER!". Hart to Hart Merc looking stunningly well kept. Another gleaming red retro-Merc. Absolutely GORGEOUS, but not low enough! A VERY unusual sight. It's a Reliant Ant! They were made from 1967 to 1987, and had a single-piece GRP cab. 700cc of power! Quite an interesting alternative to a new Piaggio Ape. If you can find one. The first in a never ending series of posts. 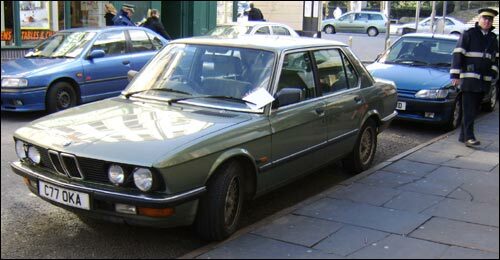 An E28 5-Series Bimmer (a 528i to be exact) in that lovely shade of metallic green that they used to do them in. Quite tidy, too! The traffic warden was looking confused. I guess he thought the Primera was more worthy of attention. 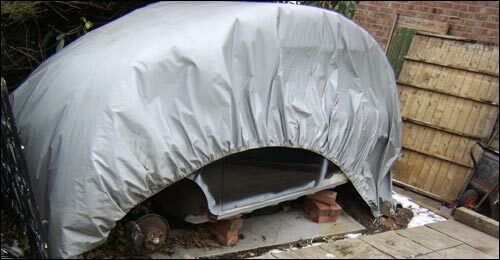 Someones Mini project, in hibernation for the winter. Wonder what will become of it? Note the high quality axle stands, and the wheelbarrow is probably for carting the piles of rust away with. I pass this several times a week, hopefully I'll get to keep an eye on progress. ...of the images across the top. Just in case you were wondering, even though I suspect you probably weren't. * An image from the box of a 60s/70s "Auto Coffee Maker". I'm not sure what the car is. How cool is that though? Find yourself a nice parking spot, overlooking somewhere lovely. Get the Auto Coffee Maker on, and several hours later there'll be heat in your drink but no power in your battery. Perfect. 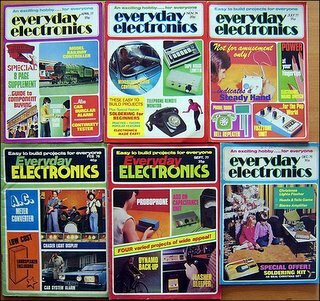 * An image from the box of the frankly stupendous Sparkrite Voyager - "The most advanced microprocessor controlled car driving computer". It was basically a horrifically difficult to wire up advanced trip computer. Apparently, it was "Designed to improve driving techniques", and offered amongst other advanced features "Instant FUEL, SPEED and TIME, date at the touch of a button", "Visual and audible EXCESS SPEED alarm", and had "All necessary fitting parts included". I want one. A lot. No idea what the car is, I suspect it's a Ford. * Two Frenchmen scratching their Berets whilst contemplating the dodgy reliability of a Renault Caravelle. * A Citroen Ami brochure cutaway pic. * A rather enticing shot of a lady admiring the plush green velour trim of a Matra Bagheera. * VW Bay Window camper, PERFECT. * A happy couple enjoying servicing and maintenance on a Sunbeam. Super. These are all the sort of thing I love best - quirky accessories and motors from the oft-forgotten sections of the retro car world. I see myself at the top of a mountain pass in my Lancia Beta Monte Carlo, parked up with my Auto Coffee Maker on the go. An adoring lady admires the interior fittings and quality of the Italian craftsmanship(!) whilst I fiddle with my Voyager, marvelling at my fuel consumption and wondering how much I can improve on my average speed time. Ahhh. Happy days. I picked up 25 issues for 10p each. 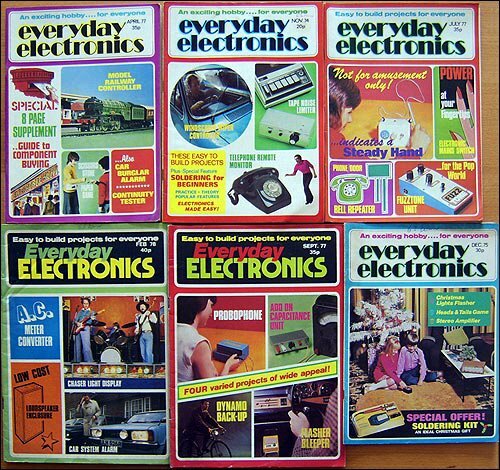 AWESOME retro 70s imagery on the covers, and the inside is all yellowy superthin paper and black and white print. Looks like I might have to get busy with the soldering iron, I can see lots of gadgetry potential for the Golf!